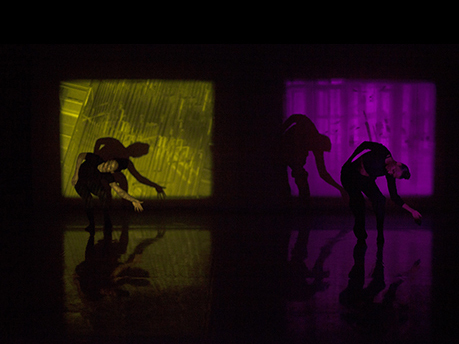 Edge Balance consists of dance movement for two dancers combined with double live 16mm projection of positive and negative film employing live hand-manipulated colour filters. The piece was initially developed by Tony Thatcher employing a hand drawn choreographic reading of the abstract movement in the film, Things To Come. Once this choreographic score had been rehearsed by Tony Thatcher and the dancer, Stephanie Bergé, Ellard and Johnstone hand-edited the 16mm negative trims from the original Things To Come shoot responding, using editing and montage rhythms, to the newly choreographed dance. In response, Tony Thatcher then watched the new film edit and developed the final section of the choreography. This back and forth movement, using drawing and notation to find rhythmic and spatial analogies between dance movement and filmic montage, continued until the piece was at a stage that it could be presented to the public as a live ‘work in progress’ performance for the Deal Festival at Turner Contemporary in July 2016. 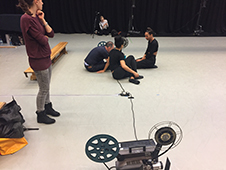 A second version of the piece was then developed using two dancers and shown at the Laban Studio Theatre in February 2017. 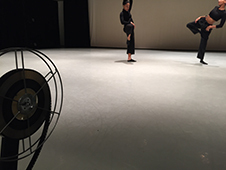 At the centre of the expanded work is a concern with space and montage: within the individual film frame, across the two projections, on stage as the two dancers move in relation to each other, and in the combination of all of these elements as the two dancers interrupt and interact with the film projections. The emphasis here is on synchronicity, doubling, mirroring and inverting. 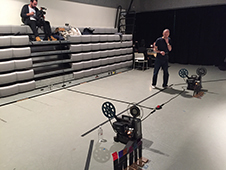 The projectors and the projectionists are on stage during the performance, emphasizing the live projection of 16mm film, and in the second half of the piece the projectionists use hand-held coloured filters to tint the raw negative images being projected. 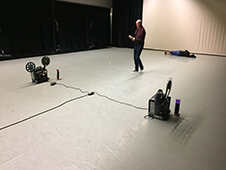 Throughout the performance the projectors and the dancers inevitably go in and out of synchronization and the choreography also plays with this bodily and mechanical slippage. Film: Graham Ellard and Stephen Johnstone.